MICE is one of the fastest growing industries in the world and is essential to the growth of the global economy. MICE visitors travel primarily on business trips and meet for the purpose of meetings, conferences and exhibitions. Those seeking a meeting room for rent will not be disappointed with Sofitel Phnom Penh Phokeethra’s range of meeting spaces, from a 1,800sqm Grand Ballroom and a pre-function area to five other smaller meeting rooms in a range of sizes, making the hotel a premier venue for those looking to hold a hotel meeting in Cambodia. The 201 spacious guest rooms and suites will have your guests felling right at home, with a soothing palettes of earth tones rich mahogany, featuring a modern Khmer touch, Sofitel Mybed bedding, and high tech plug and play electronic facilities. Rooms either overlook the magnificent river or offer sweeping city views. The fact the hotel is only 15 km from Phnom Penh International Airport adds to its attractions. Meanwhile, the hotel’s team of Inspired Meeting Planners are fully trained in bringing your meeting requirements to life. Together with the expert team of chefs and concierges, your events will leave are sure to leave a lasting impression. They are here to assist you from the preparations down to any last-minute requests you may have. The Meeting Planners also provide secretarial services (typing, minute-taking, photocopying, fax services), translation services, transport arrangements, logistics and private security. Sofitel Phnom Penh Phokeethra can even provide transport to and from the Phnom Penh International Airport because we understand that most MICE visitors tend to travel in large groups. 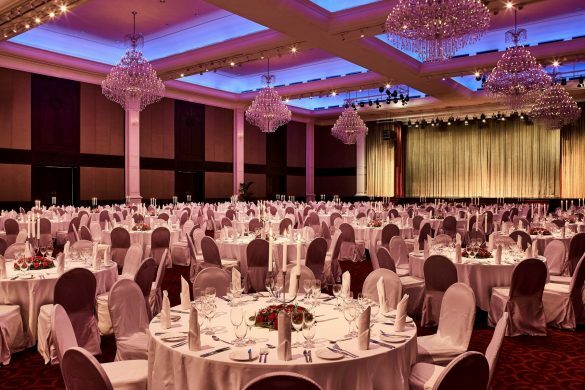 As one of the largest ballrooms in Phnom Penh, Sofitel Phnom Penh Phokeethra’s Grand Ballroom is able to accommodate up to 1,500 guests, making it an outstanding choice for a meeting venue in Phnom Penh. It is luxuriously decorated with high ceilings and elegant chandeliers and is also fully equipped with the latest electronic, sound and light technology. It is also located on the lobby level, making it easily accessible for meeting or event guests. Any kind of event from the standard business conference to the more large-scale exhibition can be held here. Another highlight is the 1,200sqm pre-function area, which is directly connected to the Grand Ballroom. Filled with floor-to-ceiling windows, allowing plenty of natural light into the space, it is ideal as a refreshment zone for large conferences. 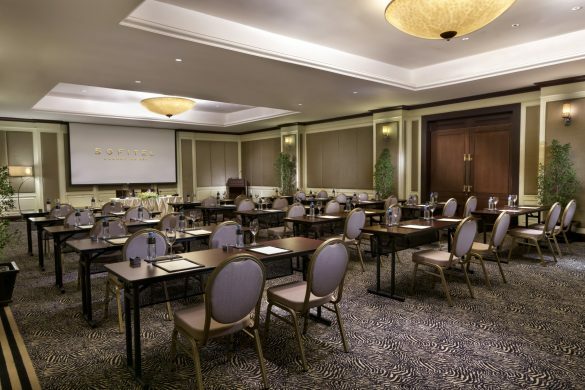 The Grand Ballroom can fit 1000 guests in classroom seating style and 200 guests in boardroom style. 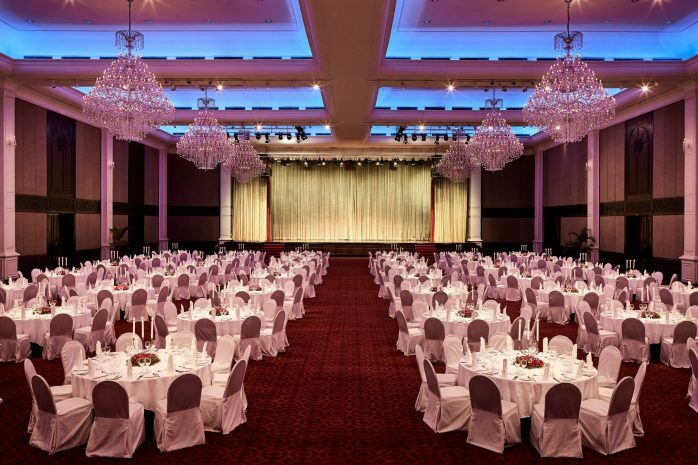 The room can also accommodate 950 pax in banquet-style seating with a stage, and 1,100 without one. It can also be divided into two smaller ballrooms upon request. Phokeethra Ballroom I and Phokeethra Ballroom II can hold a maximum of 650 and 320 guests at one time, respectively. Other facilities for hire include video conferencing calling equipment, advanced LCD projectors and oversized elevator for exhibition pieces. 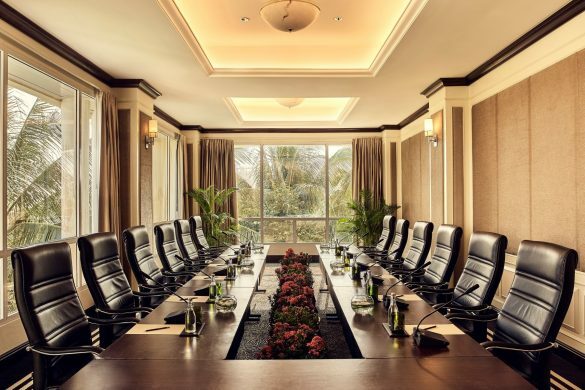 For smaller meetings and events, Sofitel Phnom Penh Phokeethra also offers five other meeting rooms ranging from 34sqm to 147sqm. 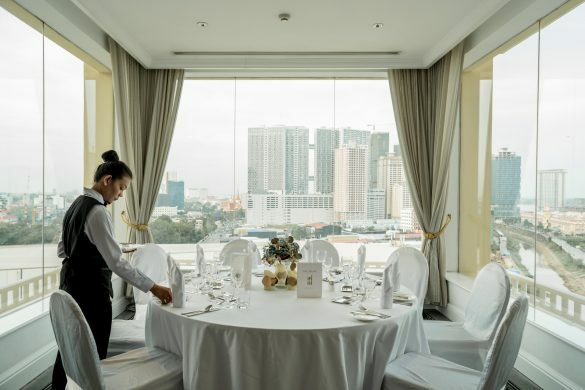 Any one of these function rooms would be considered a prime meeting space in Phnom Penh and all are situated on the second floor, conveniently near to the hotel’s restaurants. 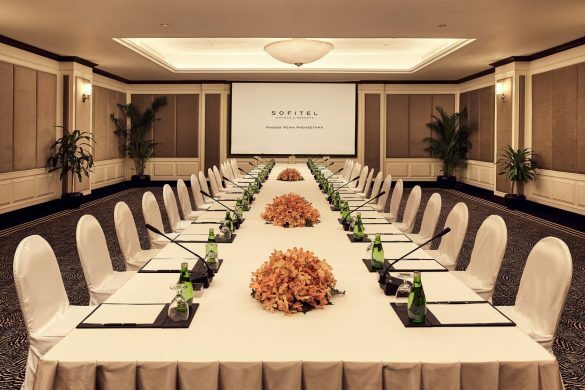 Sofitel Phnom Penh Phokeethra’s Inspired Meeting Planners will ensure the ultimate meeting or event when you pick one of these meeting rooms for rent. 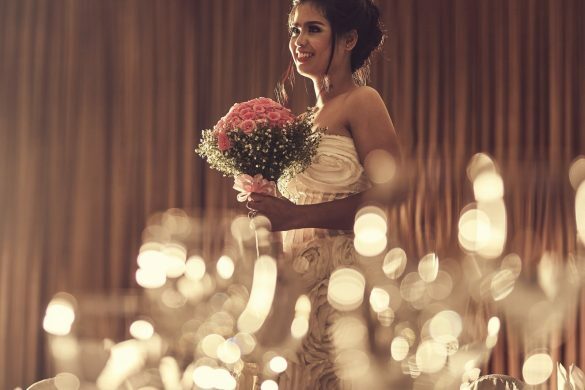 Everything from lighting and décor to floral arrangement and refreshments can be tailored to your needs. These meeting rooms are both comfortable and tastefully decorated, making them ideal meeting venues in Phnom Penh. Of course no meeting is complete without refreshments and beverages, and in this area Sofitel Phnom Penh Phokeethra once gain proves its worth as a top Phnom Penh events hotel. Restaurants and bars include La Coupole, which features international cuisine and Do Forni, which is perhaps the most well-known Italian restaurant in the city. Then there is Hachi, where guests will find only the finest selection of sushi and sashimi and the hotel’s signature Chinese resruarant which serves an authentic range of regional Chinese delicacies, Teochew dishes, Peking duck, and freshly made dim sum. 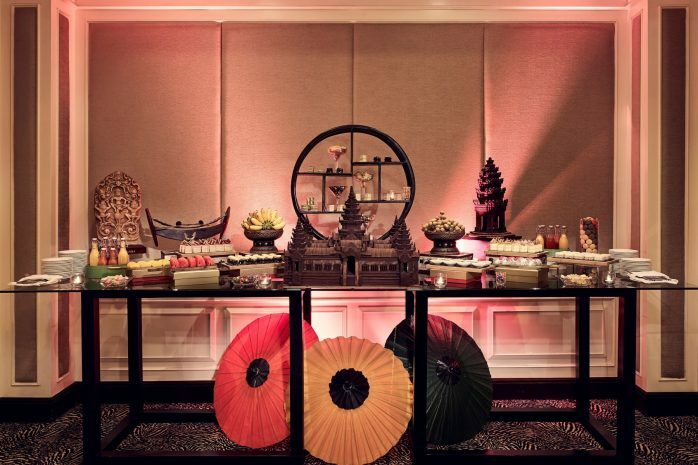 Other catering options include Chocolat, the resort’s café which boasts homemade pastries, cakes and chocolate cocktails great which adds a luxurious touch to hotel meeting in Cambodia. If desired, the resturants can also serve as unique meeting venues for business lunches or refreshment breaks for conference VIPs. Please discuss with Sofitel Phnom Penh Phokeethra’s team beforehand to see what can be done. Outside of the meeting facilities available at Sofitel Phnom Penh Phokeethra, the resort is also equipped with other amenities which will make your stay a memorable one. Guests can stay healthy at the Phokeethra Sports Club, which features the latest gym machines, outdoor swimming pools, squash and floodlit tennis courts. Guests can also relax at SO Spa, where a range of ancient traditions meet the refinement and skill of the latest in French cosmetology. The spa also includes a sauna for detoxifying benefits. Guests can also enjoy a morning at the 18-hole golf course at the Grand Phnom Penh Golf Club. The hotel concierge will be able to assist with bookings and transport. 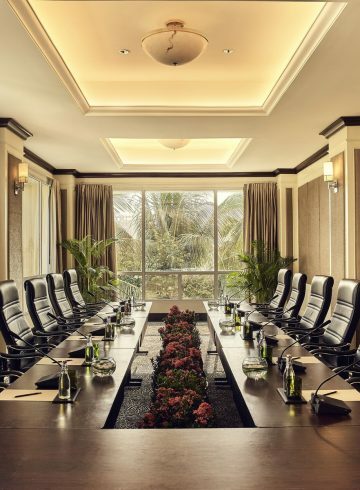 The resort’s location is also strategic for meetings and events planners. Sofitel Phnom Penh Phokeethra is conveniently close to key attractions, embassies and the central business district, as well as Aeon Mall, which is known as the biggest mall in Cambodia. Meeting guests can enjoy a tour of the Kingdom of Wonder after their hotel meeting in Cambodia. The Royal Palace is only 3km away, while the historical Riverside is only a short 1km walk from the hotel’s front entrance. Our in-house concierge can assist you in creating tour itineraries for MICE incentive visits, and advise you on the best places to visit during you stay in Phnom Penh. 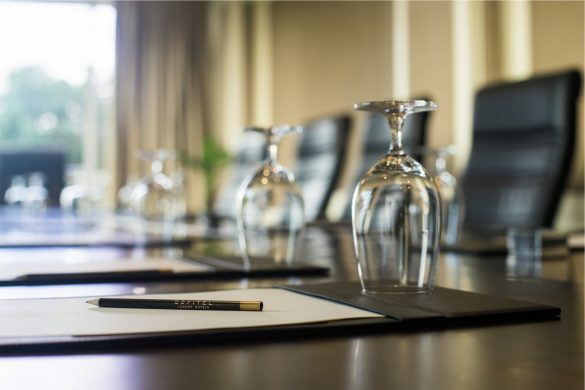 With its state-of-the-art ballroom, along with five other well-appointed function rooms, among the top meeting rooms in Phnom Penh, any meeting or event held at Sofitel Phnom Penh Phokeethra is sure to be a success. Sofitel Phnom Penh Phokeethra is a quality Phnom Penh events hotel and we invite you to grow your business with us.